But then he assured us everything will be “great.” Again. It was basically his campaign speech in a new city. 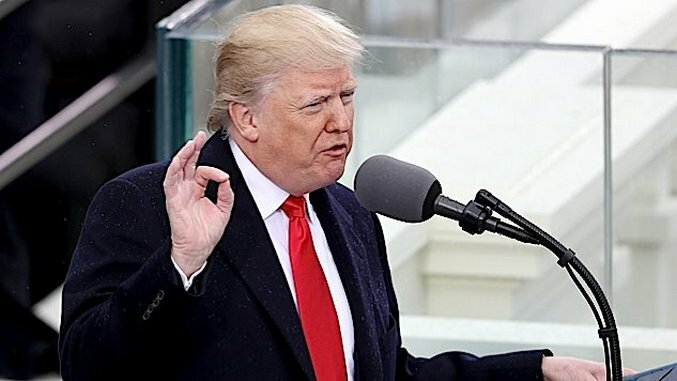 In this speech, Trump used 27 words that had never been used before in an inaugural address. These words say a lot about Trump—not just how he sees us, but what he wants us to believe our country looks like. These anomalies reaffirm what an anomaly he is for this office. Here’s the full list, provided by the Washington Post, which is phony and dishonest. Not once. What a tremendous and moving tradition of respect, optimism, and leadership the inaugural address has been. I’d also like to point out that, somehow, we’ve fought the Revolutionary War, the War of 1812, the Mexican-American War, the Civil War, the Spanish-American War, WWI, WWII, Korea, Vietnam, the Cold War, the Gulf War, the Wars in Afghanistan and Iraq, and the War on Terror all without hearing “carnage,” “tombstones,” or “bleed” from a President about to take office. Here are some of these words in their proper context. Sad: “subsidized the armies of other countries while allowing for the very sad depletion of our military.” Sad? This isn’t even true. Our military is many times stronger than any other in the world. I know soldiers who, proud of their military and their country, take extreme offense to this cynical stuff. Also, in that sentence are two other new vocab words: “Subsidized” and “depletion.” Among those militaries we subsidize at our own in expense is Israel. And Barack Hussein Obama, whom Trump criticizes as soft on Israel, gave Israel defenses more than any other president in history—nearly $38 billion of aid. Trapped: “Mothers and children trapped in poverty in our inner cities.” Poverty is an enormous problem facing the country. It belongs in the address. We need to face it. But poverty isn’t just an inner city problem. And it’s not just mothers and children. And do you think Trump is saying this animalistic, desperate word directly to black women and kids? Trapped? No. This is how he sees the world. This is how most Trump supporters really do see the problem. Trump claims he’s making an economic appeal to the white working class, and they claim the same. It’s not about race! Then how come this appeal is aimed straight at an “urban” cliche? Both descriptors are brand new. Total Trump. And which place sounds better to you? And note the binary split: Black and white. Note the negative comes first, the second one—the end; the one with more weight—is positive. Come on. Rusted; tombstones; landscape: “Rusted-out factories scattered like tombstones across the landscape of our nation.” Our (your) country is a cemetery. Trump probably said this one to Melania about a hundred times. Then we she tired of it, the mirror. The statesman-poet. Or is it maybe poet-statesman? Infrastructure; disrepair; decay: “America’s infrastructure has fallen into disrepair and decay.” Again, no, it hasn’t. We need to do a lot of work. Some spots are pretty dangerous. But the whole nation’s infrastructure isn’t like this. This slippery slope of fear is dangerous in its subtlety. Stealing: “We must protect our borders from the ravages of other countries making our products, stealing our companies, and destroying our jobs.” Stealing our companies, such as Trump’s own, who choose to leave America because of incentives elsewhere. And for the millionth time, the unemployment rate is under 5%. Ripped: “The wealth of our middle class has been ripped from their homes and then redistributed across the entire world.” I don’t even know what this means, but he wants white people to think things have been stolen from them with a great, sudden violence — not the slow, erosive process that it’s been, the same slowness which also masked the urgency of this very plight. Also note that he slipped “form new alliances” in there, then drowned it out by shouting the radical Islam stuff. He probably wanted to use another word I imagine hasn’t been used before: Russia. So this what our President chose to point out to us about America. These are the images of our country he wants us to see as he takes power.About thirty minutes after his speech, it seemed to come true. Police and anti-Trump protesters clashed on K Street. Tear gas. A fire. 100 arrested. American carnage. Maybe he’s right. Or maybe he needs to prove himself right.